Sharing center stage–exotic dark black rice and a unique jade green veggie. Supporting players–bright orange carrots, green onions, and tamari-roasted cashews. The finishing sparkle–a zesty dressing of lime juice, sesame oil, and tamari. 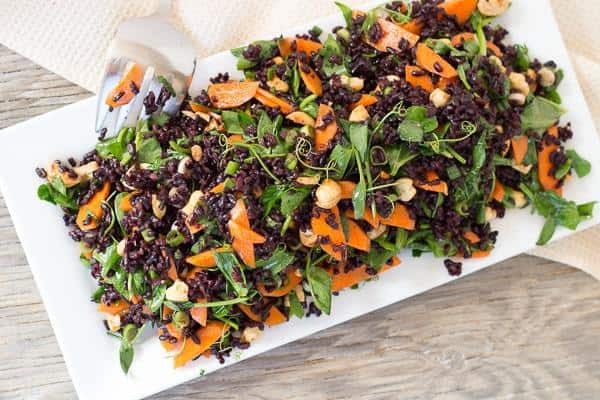 You can count on 5-star reviews for this striking nutritious and delicious black rice and pea shoot salad. A tangle of the crunchy sweet pea shoots in our CSA farm share box introduced me to this delicate playful green. Until then, I’d never thought to snip and savor the young leafy tips and tendrils that climb a snow pea trellis. Yet pea shoots have been an Asian staple for ages–Chinese cooks call them “mustaches of the dragon.” Pea shoot tendrils do kind of twist like the ends of a mustache, don’t they? 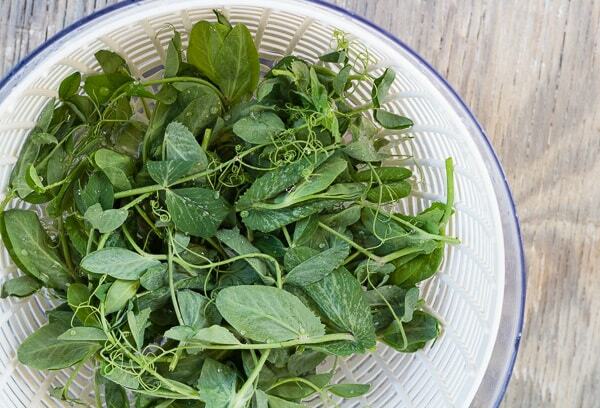 If pea shoots aren’t coming your way, chop up some snow peas instead. Yesterday, in the store that made big news last week, I caught sight of a clear clamshell of the pretty shoots. I guess that means the pea-flavored gems with the charming curl have made it to the big time. It’s written that in ancient China black rice was called “forbidden rice”, because only nobles were allowed to enjoy its wonderful slightly-sweet roasted nutty taste and tender texture. 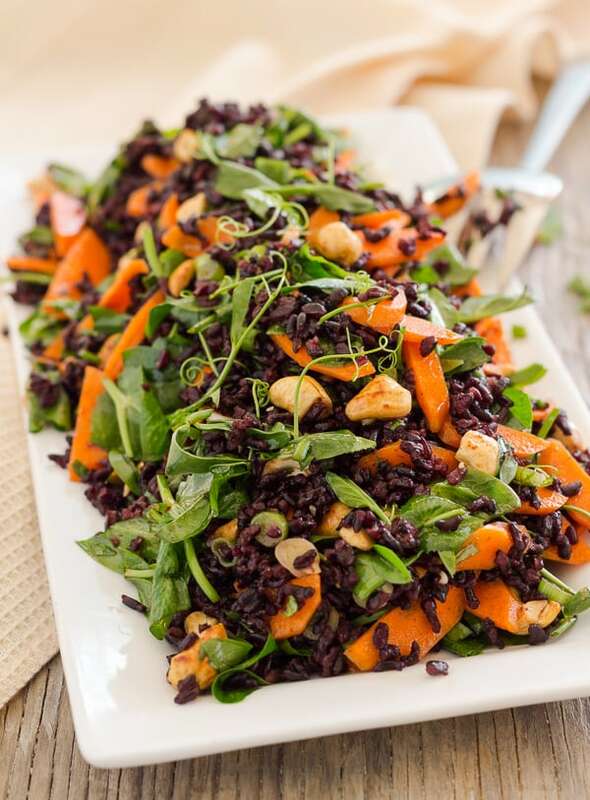 Lotus Foods has trademarked the name “forbidden” black rice, so, technically, it’s forbidden to name this salad forbidden black rice and pea shoot salad. Unless you use Forbidden Rice®! Smarty-pants observations aside, this is one healthful colorful salad. Mix in cashews, for protein and healthy fat, tamari-roasted for umami flavor. Black rice’s remarkable color tells us it’s an anti-oxidant superstar, similar to blueberries. Leafy green pea shoots carry low-calorie nutritional weight, and carrots, well, eat your carrots. 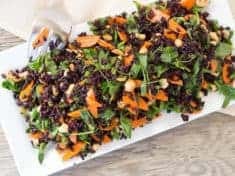 Make this incredible black rice and pea shoot salad–it’s a showstopper! You might also like this Teriyaki Butternut Squash with Black Rice and Edamame. Or Lacquered tofu with Spinach, Arugula, and Black Rice. Wishing you a fabulous week–get in the kitchen and cook something healthy, seasonal, and delicious! Bring this striking salad to a potluck party. Or serve it simply, with lettuce greens. Bring 2 cups water to a boil; add rice, cover and return to a boil, then reduce heat to very low and cook, covered, 30 to 40 minutes, or until the water has been absorbed. (To see if the water has been absorbed without stirring, tilt the pan to the side.) Let sit for 5 to 10 minutes to cool. Fluff with a fork. Make a dressing with the tamari, lime juice, avocado and sesame oils, cayenne and salt. Stir the dressing into the cooked rice. 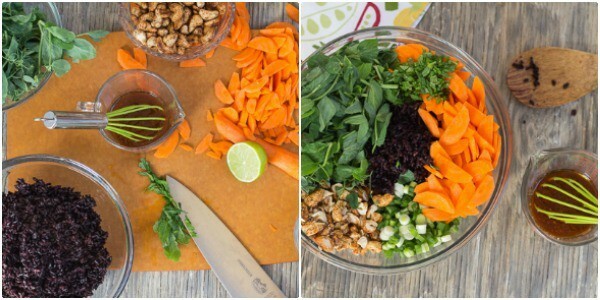 Mix in the carrots, green onions, cashews, pea shoots, and mint, if using. You can serve the salad warm like this or refrigerate until cold and serve later. If you can't find pea shoots, slice up some snow peas and add them instead. 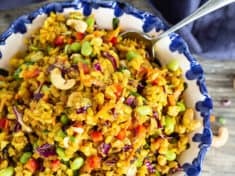 Use tamari roasted cashews from the bulk bins, or make your own tamari roasted cashews stovetop, in a cast-iron skillet, using 1 cup raw whole cashews and 1 tablespoon tamari soy sauce. Follow these basic directions. 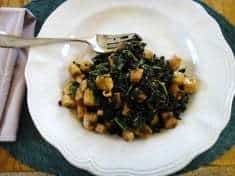 ** This is an updated recipe with new photos. I posted the original recipe for my CSA in July 2009, and we migrated it over from my old muffintalk blog. My trainer has just added Black Rice to my diet, so i was just checking out its health benefits and all. I came across this post and i must say that you have explained things really well. Moreover, with that i just got a wonderful recipe as well.